KT Tape was featured on the popular Tennis Channel program, Fit to Hit, during the summer. The show featured the lead physical therapist and athletic trainer for the ATP, Clay Sniteman. Sniteman uses KT Tape on tennis pros to relieve pain, reduce swelling and accelerate healing from their injuries. Tennis pros love it because it allows them to continue training and competing as they recover from such injuries as tennis elbow, rotator cuff injuries, wrist strain, knee pain and more. The elastic properties of kinesiology tape allow it to provide support for an injured or overused area without restricting movement, a critical feature for tennis players who need to access their full arsenal of moves during tournament play. For most recreational tennis players, tennis season is back in full swing after an extended break between Thanksgiving and late January. For many, taking a break for a few weeks was just what they needed to recover from nagging overuse injuries such as tennis elbow. Unfortunately, tennis elbow is one of those maladies that can rear its ugly head at any time, being triggered by a new racquet, a technique change, or even a workout with old, heavy balls. This is the type of injury that is perfectly suited for kinesiology taping. For players with tennis elbow (or anyone else afflicted with lateral epicondylitis), kinesiology taping can relieve pain, reduce inflammation and accelerate the healing process. It soothes and supports those overused forearm muscles, as well as their attachment on the lateral epicondyle – the bump on the outside of the elbow. One of the most loved features of kinesiology taping for tennis elbow is that most players can continue to play and compete as they heal. Following is a simple kinesiology taping technique for tennis elbow, presented by RockTape, a new kinesiology tape designed for performance athletes. The following video shows chiropractor, Dr. Scott Swanson, demonstrating the proper technique for applying Kinesio Tape to someone with tennis elbow. This application technique is designed to increase circulation to the overused extensor muscles of the forearm, helping to reduce inflammation. It also reduces the activation signals to these muscles, allowing them to relax and recover from the lateral epicondylitis condition. This is the second in a series of articles on kinesiology taping for tennis elbow or lateral epicondylitis. Kinesiology taping is an exciting new development in the treatment and management of tennis elbow or lateral eipcondylitis. This thin, lightweight, stretchy tape can be worn 24/7 for several days, providing round the clock therapy and relief for stubborn cases of elbow pain. Different taping techniques can be used, depending on the desired outcome. For example, to reduce acute inflammation and help overused muscle relax, the tape is applied from the insertion (wrist end) toward the origin (elbow end). Both the muscle and the tape are stretched during application to maximally enhance circulation and take pressure off the inflamed muscle. This type of taping would be most beneficial during the acute stages of tennis elbow when activity levels have been restricted. It will enhance and prolong the benefits of physical therapy when worn between therapy sessions. The following application instructions are for using a roll of kinesiology tape (as opposed to a pre-cut application, which will be discussed in my next post). 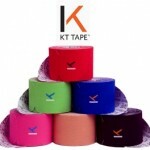 The two best known brands of kinesiology tape by the roll are SpiderTape and Kinesio Tex Tape. Both come in rolls that are 2″ wide by 16.5′ long, and in four colors – black, blue, pink and beige. This kinesiology taping technique is designed to reduce the inflammation in an acute case of tennis elbow and to help the muscle relax and recover. In this instance the tape will be applied from the insertion (wrist end) toward the origin (elbow end) of the wrist extensor muscles. 2. Flex the wrist (palm toward inner side of wrist), then rotate it slightly to the outside. 3. Remove the backing from the first inch (anchor end) of tape and apply with no stretch on the back side of the wrist, immediately above the hand. 4. Remove the backing from one side of the “Y” and stretch the tape approximately 25% of it’s available stretch. Carefully apply the tape along the inner border of the wrist flexors, ending just below the elbow. Apply the final 1″ of tape with no stretch. Rub tape to activate adhesive. 5. Remove the backing from the other side of the “Y” and stretch the tape approximately 25% of it’s available stretch. Carefully apply the tape along the outer border of the wrist flexors, ending just below the elbow. Apply the final 1″ of tape with no stretch. Rub tape to activate adhesive. 6. Cut a strip of tape approximately 3″ long. Tear the tape backing in the middle of the tape and peel backing back 1″ in each direction from the middle. 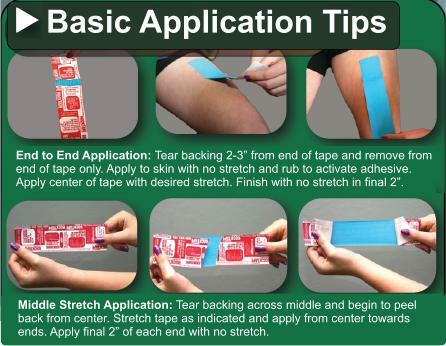 Stretch this part of the tape to add 40% to its resting length, then apply directly below the elbow, partially covering the ends of the Y strips. Rub tape to activate adhesive, then apply the ends of the tape with no stretch. 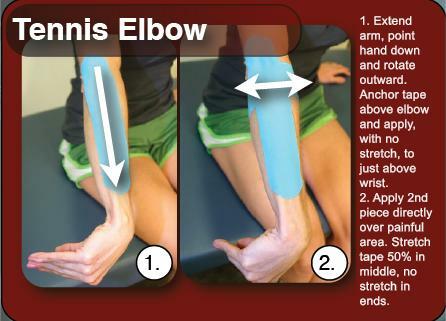 Remember, that this type of application is best for acute cases of tennis elbow, during a break from activity. My next post will outline a different taping technique for those who are ready to return to activity. 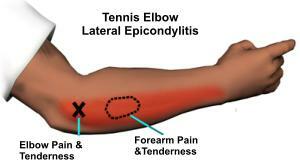 Tennis elbow, or lateral epicondylitis, is a very common and very frustrating injury among racquet sport players and others who actively use their forearm muscles. 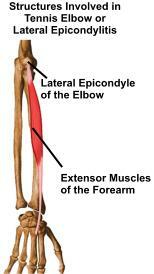 It is characterized by pain and tenderness on the outside of the elbow (lateral epicondyle), that may also radiate down the forearm. Many cases of tennis elbow respond to simple therapies like rest, ice and anti-inflammatory medication within a few weeks. Others, however, are more resistant to treatment, and become long-lasting chronic conditions. There are as many treatments for tennis elbow as there are causes, and many sufferers expend significant time and money before finding the best solution for them. Home-based treatments include elbow braces or supports, forearm straps to compress the wrist extensors, shock-absorbing devices worn near the elbow, liniments and creams, and over-the-counter anti-inflammatory medications. Medical interventions include acupuncture, prescription medication, cortisone injections and physical therapy to stretch and strengthen the surrounding musculature. Surgery is rare, but may be required in serious cases. Kinesiology taping is an exciting new development in the treatment and management of tennis elbow. This thin, lightweight, stretchy tape can be worn 24/7 for several days, providing round the clock benefits for stubborn cases of elbow pain. Compared to traditional athletic tape which only provides support and restricts movement. kinesiology tape actually has therapeutic properties. In addition to rapid relief of pain, it also increases circulation, which reduces inflammation and accelerates the healing process. 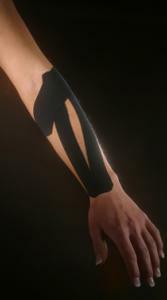 A well-applied kinesiology tape application is like receiving tennis elbow therapy 24/7 for days at a time. My next posting will discuss different kinesiology taping techniques for lateral epicondylitis in various stages of inflammation.